~Katarina, "Mom, you need to come over here and see this surprise I have for you." 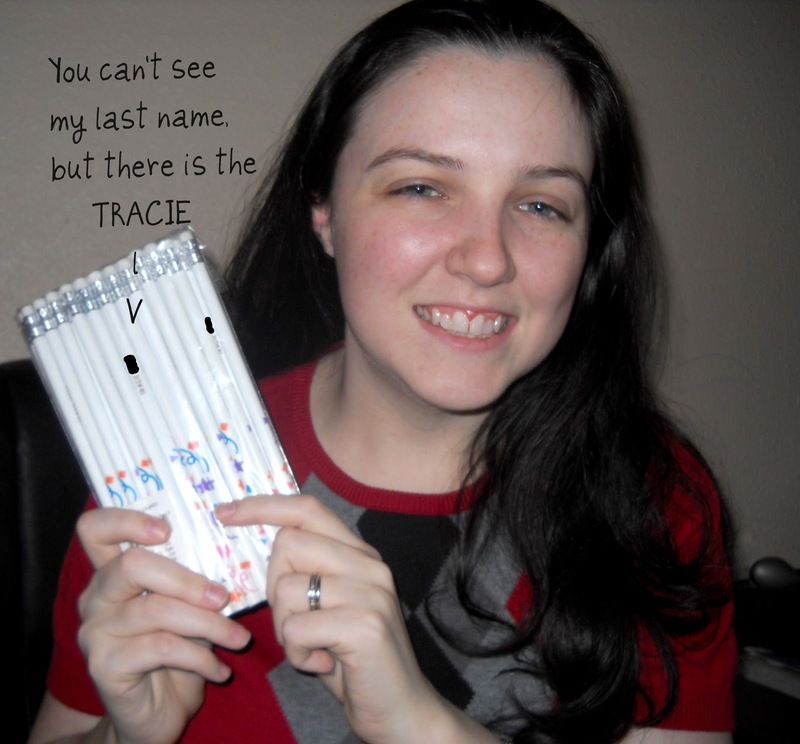 Tracie, "Is it a project surprise, or a picture surprise, or some other kind of surprise?" Katarina, "If I tell you what it is, it would not be a surprise. Just a prise. Don't loose the 'sur', come see it for yourself." ~I'm part of a group on facebook called We Support Mackenzie Phillips & All Survivors Speaking Out Against Abuse. Today marks one year since this group was created. It's a birthday. It's an anniversary. It's a Birthiversary. It started as a way to show support for Mackenzie Phillips when she spoke out about abuse and turned into a real community of survivors. When my friend Meggs wrote about the birthiversary on her blog, she talked about what she has learned over the last year. This one really hit my heart, "Blood may be thicker than water, but it's not thicker than the tears you've shed with your fellow survivors. I can choose my family." ~I watched the season seven premier of The Office last night. Did you? I was happy to see Kathy Bates was still there. I just love her. I was not sure about them having a famous actor come into the cast last year, but when it turned out to be Kathy I was excited. and then renamed herself "Schmeel-shoriffish"
That is how much I love her. ~Last week I told you my sad story about pencils. Just because my name is spelled different, when teachers would buy personalized pencils for every kid in the class, I would get a blank one. No name. Very sad. There was one year that I didn't mention. Fourth Grade I got a pencil with my name, spelled Tracy. My mom tried to console me by saying, "At least she tried. It is close to your name." I should have spelled words wrong on a spelling test (actually, I did do that all the time) and then challenge my grade by telling the teacher and my mom, "At least I tried. It was close". But all those blank pencil memories have changed as of today. Today they have a happy ending. My fabulous friend Diana told me that there was a package coming for me. It arrived this afternoon and what was in it? Every single one of those pencils has my full name on it! She also sent a pack of pencils with Katarina's name. My inner child and my outward adult are now very happy. ~When I went to the office to pick up my mail, I was wearing that sweater-y shirt. It is strange. Short sleeves, yet still kind of a sweater. The guy asked me if I thought it was winter outside. I told him that I am singlehandedly bringing in fall with my cold weather clothes and high expectations. He didn't seem impressed. More Friday Fragments can be found at Mrs.4444's place, Half-Past Kissin' Time. Katarina rocks my face off. Our group rocks my face off. I choose you as my second sister (since I already have a blood sister who is fortunately an amazing person as well)! Kathy Bates rocks my face off though we don't have cable and will have to catch the new episodes on Hulu or something. Those pencils rock my face off. Diana rocks my face off. That was so sweet of your friend to send you pencils! I always hated when we would go on vacation or something and I wouldn't be able to find a little license plate or anything with my name on it. There was usually a Joyce though. Surprise presents are always fun! Very nice dear one. What a sweet gesture. Also, thank you for all your encouraging comments to me. Blessings. I love Kathy Bates AND your new pencils! :) What a great friend. I could never get anything with my name on it as a child. That's probably why I love personalized stuff so much these days! I feel your pain with the pencils. Nothing EVER has my name on it. I find Claire and Ethan's names everywhere, but I'm afraid that Grayson and I are in the same boat when it comes to personalized products. This is where I hope my sewing skills pick up so I can make him his own personalized things. I, of course, had the most common name ever, with the most common spelling ever, growing up, so when I named my kids ... well, off the shelf personalized items are pretty rare for them, shall we say! I love The Office! Congrats on your neat gift. Tracie, I like those pencils! What a nice friend. Personalized items always give a sense of pride in ourselves... I get personalized Christmas ornaments for my girls every year. Putting up the tree every year, it's like getting the gift all over again. Though, I fear I'll need a bigger tree soon! I agree that you can choose your family. Lots of people just don't know that. I LOVE that your friend bought you pencils with your name spelled right! I never had that happen to me, but the "J" things were always sold out when I was into that stuff as a young person. I was always disappointed. Nice to have closure on even a simple thing like that - just feels good. Now the only part missing from this post is I'm left wondering what your "prise" was! As a "Traci", I so get the pencil thing (and stretchy belts and barettes). No one ever splells my name right -- in fact, I uesd to introduce myself to new teachers as "Traci with an I". While I am not a survivor of abuse, I applauded Mackenzie Phillips. I thought she was incredibly brave and I was sorry that some chose to speak against her. And I am SOOOO there with you about Kathy Bates. She rocks!!! What a good friend! Enjoy those pencils. Love the story of the pencils! I love kitchy stuff like that too. Honestly, I don't think I'll ever outgrow the feeling of owning something with my name on it! The girl who sent you the pencils for you AND Katarina----ROCKS MY SOCKS OFF. A pile of awesomeness right there. so sweet! And Katarina quotes make me smile. Just today, Izzy told me she wanted to be a "vegetenarian" like me. LOL! Cool gift to right and old wrong. And I hate to learn I missed the season premiere of the Office. I LOVE that show. Popped in from SITS! Who doesn't love fresh pencils for fall! I totally hear you, sister. With a name like KEARSIE, there wasn't much happening for me in the way of novelty key rings, coffee mugs or pencils. Nay.